2016 - Page 20 of 20 - Marketing & Brand Strategy. Steve Poppe, Founder. When Brand Building Isn’t Brand Building. ABC Communications is a creative marketing partner to our clients. We are experts in building brands and promoting product across all media channels. Our ability to seamlessly integrate online and offline communications in a compelling, unique and effective manner has given us recognition in the quickly growing online community. Providing inspired ideas and compelling creative that empowers and optimizes market presence is our passion! It’s an agency. Their specialty seems to be integrating off- and online work. So 2009, don’t you think. But let’s not be catty. My problem here is with the use of the words “brand building.” Copy the first para. of every agency website extant and paste it into a file then search for “brand building” and you’ll get an 80%+ hit rate. Why? Because every tactic can be seen as brand building, so say the unwashed agency masses. Real brand strategists know otherwise. Brand building starts with a real brand strategy. A claim or promise and unique proof array. All the marko-babble about “mission” and “values” and “personas” and an assortment of similar agency taxon used to create a halo of understanding between agency and brand marketer really just comes down to “Is there an organizing principle in place that allows for brand building, in a measurable way, that ties to sales.” With measures that are discrete and finite. In a way that allows brand managers to say “no.” If so, you have a brand strategy. And you can build brands. Otherwise your tactics are nothing more. A loose federation of acts to increase awareness, interest and sales. Simple templates for action. The What’s The Idea? brand strategy development process can best be explained in three stages. They are quite serial in nature but can overlap. Discovery is discovery. Conduct category research, ask a lot of questions of stakeholders, customers and prospects and be in thorough learn mode. Learn language, customer care-abouts and brand good-ats. Part fact-finding exercise, part search for feelings and attitudes (pal Megan Kent counsels “Feelings trump reason”). discovery fills the brain and content receptacle with lots of stuff. Fermentation is just as it sounds. It’s the part of the process where there is active, unbridled growth. Action and reaction. Some bubbles. Lots of churn. It’s the most creative part of the process. Sometimes fermentation occurs during REM sleep, other times it takes place in the shower, or while mowing the lawn. It’s where ideas beget ideas. The fermentation process is nature and random. Serendipitous and planned. Lastly we have the boil down. This is where everything from Discovery and Fermentation goes into a large metaphoric stock pot. Heat is applied and evaporation starts. 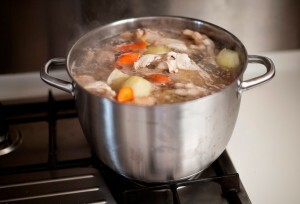 Water and non-essential information, data, proof, care-abouts and good-ats are boiled away. This is where the tough decision are made and priorities established. What comes out of the boil down, with the help of a brand brief, is One Claim and 3 Proof Planks, AKA the brand strategy. And there, ladies and gentlefellows is how we make the sausage. Peace. Stale is Bad for Business. Can brands get stale? B-school professors will tell you companies go through maturation stages: growth, mature, harvest. Investment spending is heaviest during the growth period while milking profits and low investment occurs in the harvest period. Mature is the middle period where all the hard decisions are made. Mature is where real money happens and success is fickle. This is the period where brands can get stale. (First off, let me acknowledge that brands aren’t companies and companies aren’t brands. Though sometimes they are. IBM is a company and also a brand. P&G is a company but not a brand. It’s complicated.) For this discussion let’s just say B2B companies are brands. I’m a big proponent of a brand strategy: Once claim and three proof planks. This framework provides an organizing principle for product, experience and messaging. It works for tooth whitener, wholesale fish purveyors and billion dollar healthcare systems. Unlike a tagline, graphics style manual and ad campaign (the drivers of most brands), a brand strategy allows for freshness and flexibility. And it works in all the life stages of a brand. A brand strategy provides business winning strategy directives. It fights staleness when in the hands of smart brand managers. Brands can get stale. Business executives become most sensitive to it when sales are down. When the campaign becomes too familiar. If business fundies are without flaw, e.g., headcount, distribution, pricing, then I always suggest getting the brand strategy right. It’s how businesses and brands flourish. Peace.